A horse mural is an effective wall decoration - majestic white horses will give your wall a chic look and will emphasize the style inspired by the world of nature. 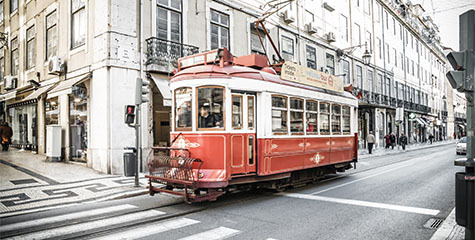 Such photograph will work well in traditionally arranged interiors - it will also nicely fit a glamour decor and a composition with rustic accessories. 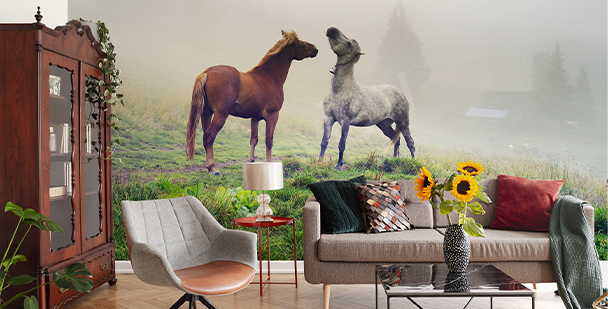 A horse mural will make your space look more sophisticated and fairy-tale-like. 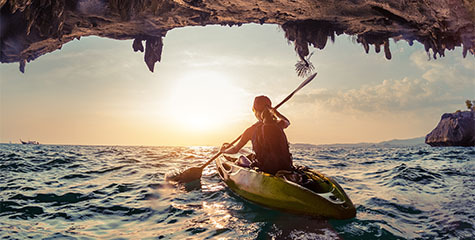 Among various photos and graphics, you will surely find a decoration with a motif of those dignified animals, that will perfectly fit into the color scheme and style of your bedroom, dining room or living room. 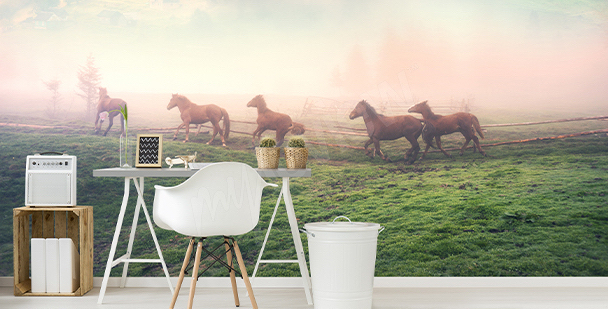 Horse wallpapers will change the look of your interior in a blink of an eye, adding it some warmth and fantasy. An elegant mural with a white horse is a perfect option for a classic living room – it will give it charm and will illuminate the interior. 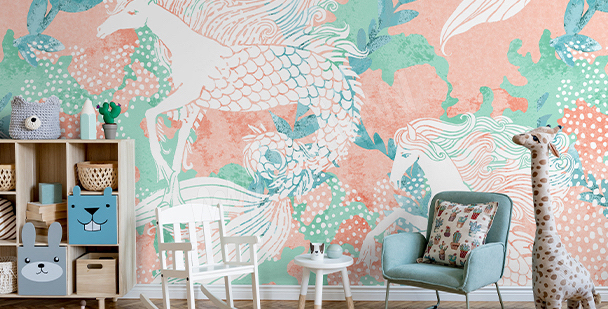 A mural with colorful horses will be a great option for a children’s room, which will bring a wave of color and shapes. A mural with a close-up on Arabian horses is a universal decoration, that will work well in almost every style of interior decor. A mural with a graphic motif of a horse and motivational quote will work great in a bedroom, where it will boost your energy from the moment you wake up. A mural with silhouettes of galloping horses will make a décor look more dynamic without taking away its classic, elegant look. 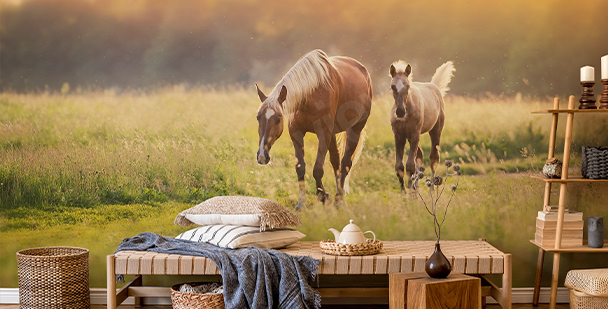 A climatic mural with a horse in toned-town, warm colors will bring a calm, romantic atmosphere into your interior. 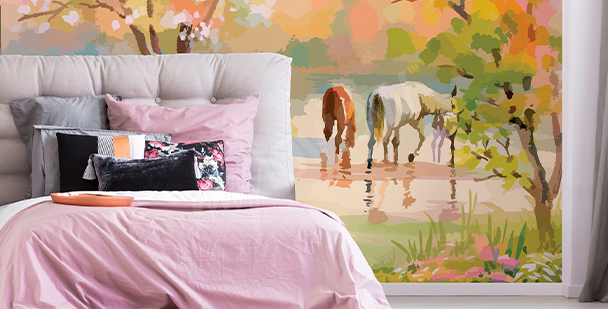 A mural with silhouettes of three galloping horses is a modern solution for every lover of realistic wall motifs. A mural with a graphic motif of a black and white horses is a great idea for improving a decor of a wooden staircase. Monochromatic interiors don’t have to be boring! Thanks to the use of black-and-white mural with a horse, your interior can look more interesting. 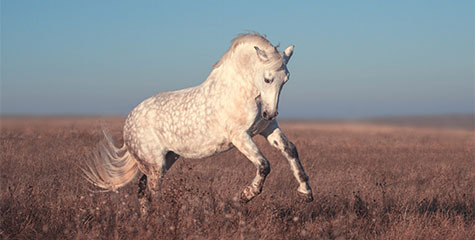 Horses remind us of freedom, wisdom and grandeur. 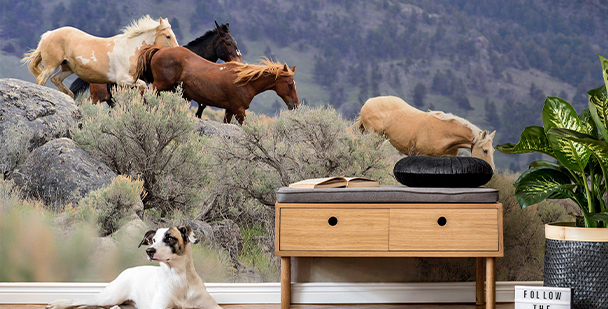 Noble and sophisticated horses integrated into a wall will completely change it’s look. An animal motif on horse wallpapers are best to be used in classic arrangements and interiors dominated by nature-inspired details and accessories made of natural materials. 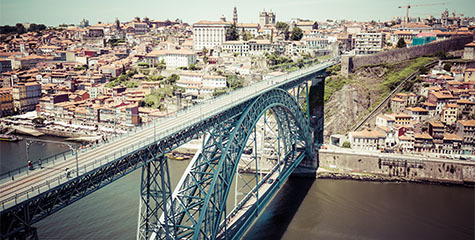 This way, you will emphasize the style of your interior. 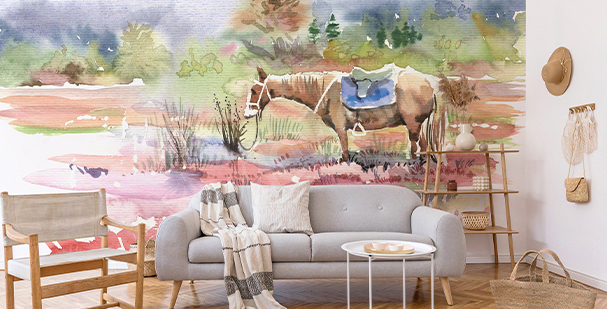 With help of a horse mural, you will add a sophisticated touch to an elegant living room, and a fancy character to a traditional dining room. White horses will look beautiful as a background of a bright, modern sofa. 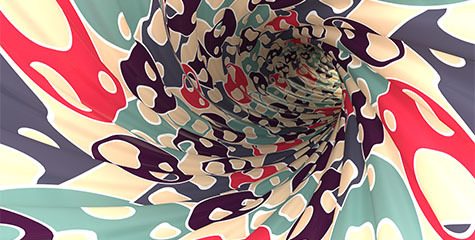 Horse wallpapers will emphasize the beauty of glass accessories and plush details, for example of a carpet and pillows. Black-and-white photos can be successfully applied to a living room which decor is based on wood in every shape or form - an atmospheric decoration will create a unique vibe in your interior. A horse mural will highlight tasteful arrangements, that are dominated by richly decorated accessories, and it will add an expressive look to a toned bedroom. 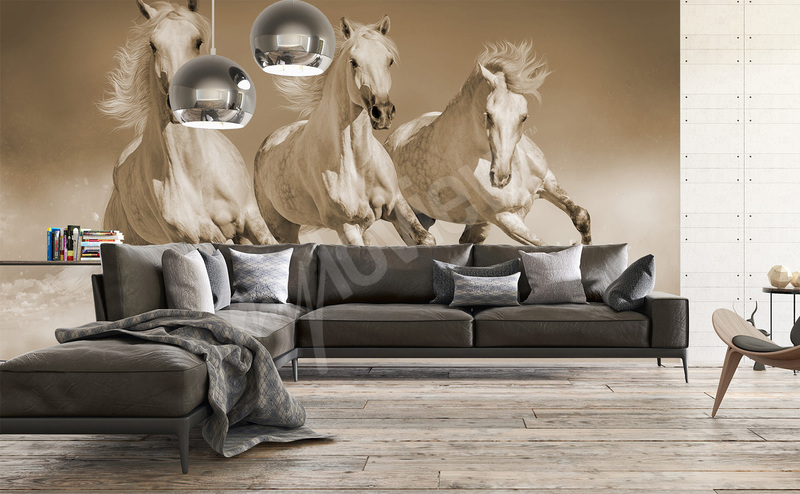 Horse murals will look great in interiors arranged in a rustic style. A wall decoration with an effective animal motif will improve your idyllic living room, and will emphasize the beauty of stylised accessories, floral accents and elements made of natural materials. 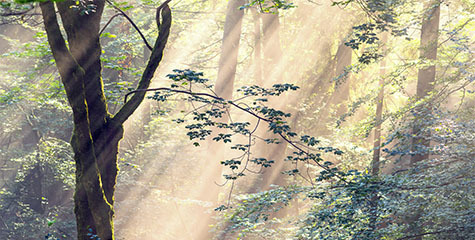 Wallpaper with horses will look great in spaces decorated with stone, wood, brick and sandstone. 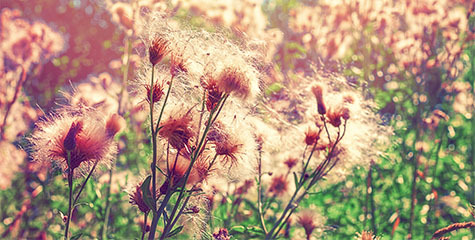 Such decoration will emphasize a rural, climatic decor and will give it a cozy look. 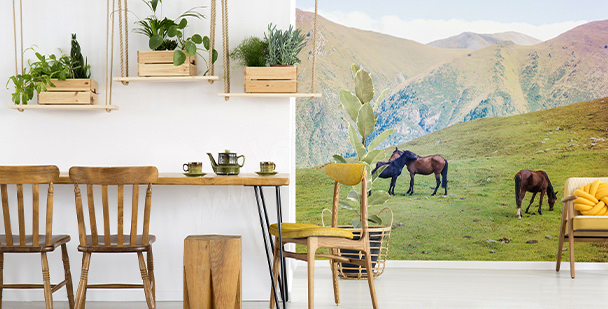 A wallpaper with a horse will create a wonderful atmosphere within an interior. And that will help you rest in the privacy of your home. A photography can be successfully applied between wooden furniture, white accessories and stylised furniture - with it’s help, you will create a fairy-tale and fancy look in your interior. 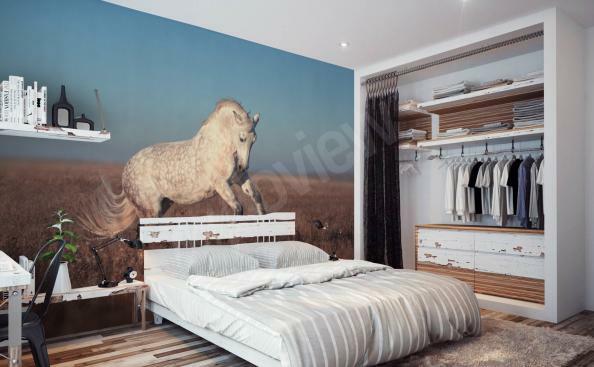 Friesian horse wallpapers will enliven a rustic interior and will give it more expressiveness, and white horses will become a subtle detail of your decor - they will bring lightness and harmony into your bedroom or other rooms. A wall decoration with a horse motif will be a perfect choice for a romantic interior - it will make your interior look sophisticated, nostalgic and charming. A white horse mural will emphasize the atmospheric details and subtle accessories - plant motifs, bright accents, light and delicate textiles. 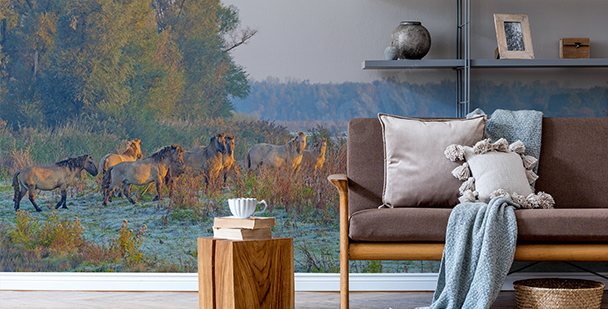 A photo with a black-and-white landscape with horses can be successfully fitted into interiors, which decor is based on classic, toned colors - beige, snow white, creme. Horses will blend perfectly with carved furniture and climatic accessories - an openwork lampshade and glass candleholders. In our store’s collection, you can find not only horse murals, but also some magical creatures - pegasi and unicorns. 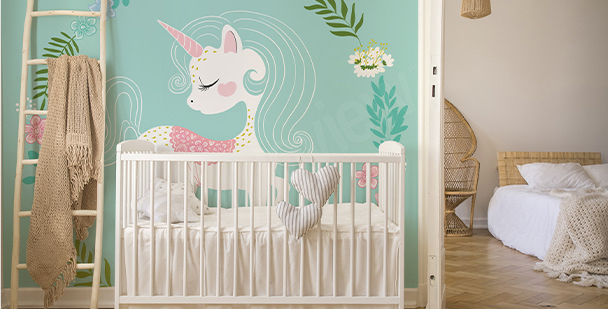 A wall decoration with a fairytale motif can be successfully applied into your child’s bedroom. 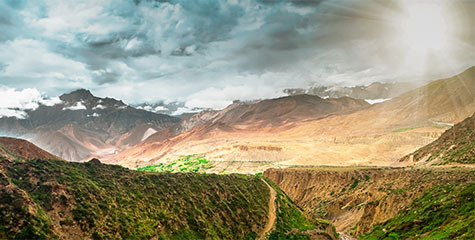 A wall with an expressive photo will gain a beautiful look and a fairy-tale character. Colorful wall murals and mysterious creatures will foster creative games and playtime. Graphic accents will look great in a children’s room - they will stimulate your children’s imagination and curiosity about the world.